List out your top go-to-market initiatives/priorities for the next 6-12 months. 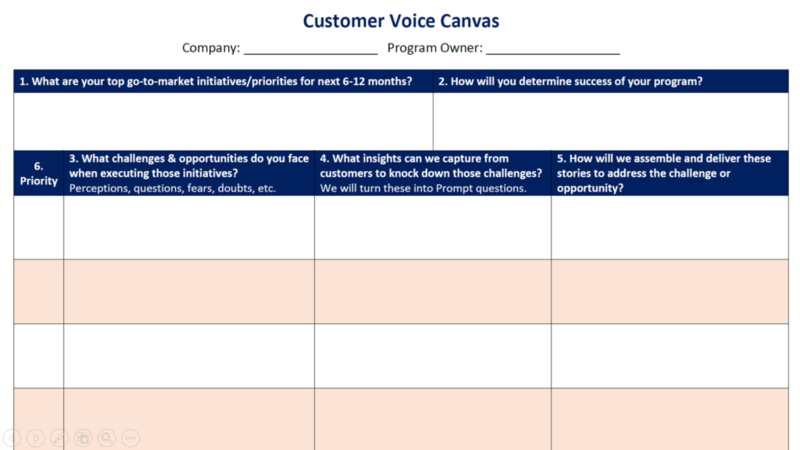 Determine how you’ll assess the success of your customer voice program. What does success look like? Surface the biggest market challenges that keep you from achieving those initiatives. These can be perceptions, objections, questions, fears, doubts, competitor lies…just about any obstacle or opportunity. Determine the customer insights that if captured, would knock down these biggest market challenges. These insights are knowledge, experiences, and advice from customers. We’ll express them as questions to ask your customers to capture their stories. Start to map out how you envision using these customer stories. How will you combine stories to support your use case? In what channels will you use these stories? Prioritize your list, and now you have a roadmap for the top use cases for unleashing the customer voice.